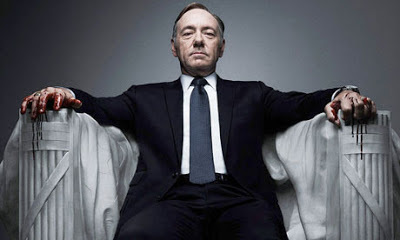 Plot summary: Despite helping the President-Elect come to power, Chief Whip Frank Underwood (Kevin Spacey) is overlooked for Secretary of State. He feigns loyalty, agreeing to usher an education bill through Congress within the President's first 100 days. Instead, he scuppers it by leaking a radical left first draft through the press via an ambitious young metro reporter, Zoe Barnes, who crudely attempts to capture his attention sexually (Kate Mara). Meanwhile, we learn that Frank's wife Claire (Robin Wright) runs a charity and appears loyal to him. And we see Frank exert his power over Congressman Peter Russo (Corey Stoll), a philanderer and casual drug user. Comments: As expected, the writing and production values are slick and smart. Fincher's palette is cool blues and browns, the production design classic luxe. Nowhere is this more epitomised in Robin Wright's beautifully groomed wife. Spacey's Frank exudes power, but in a less overtly Machiavellian manner than Ian Richardson, which is less entertaining but more realistic. I liked the subtle humour - the education guru sitting next to his book titled "Learning about learning" - the inaugural address seemingly lifted from a Whitney Houston song, "I believe the children are our future..."
Stylistic choices that irked me? Somehow, the device of having Frank break the fourth wall and speak to camera seems cheap in the wake of Don Cheadle in House of Lies. I found the score to be derivative of the Scandinavian version of The Killing. The debate about old versus new media in the thinly veiled Washington Post is old hat, and quasi Newsroom, which is never good. The visual depiction of text messages seems derivative of Sherlock. And casting an actress who is clearly Asian to play the Latina Presidential Chief of Staff. Overall, a promising start. Not sure why we're spending so much time with Claire's charity or Peter Russo, but clearly track is being laid and I'm interested to see where it leads.